As Dermaline Facial and Skin Care Center (Davao branch) celebrates its 5th year of providing premium wellness service, world-class medical aesthetics and treatments to Davaoenos, it is happy to give back to its valued customers (and even to future clients) through this exciting giveaway where participants get a chance to win exclusive prizes! 3. Put a caption: “Hi [tag (5) five friends here], Dermaline Davao 5th Anniversary Giveaway Treat is here and get a chance to win prizes too! 4. Posting of entries is until 10 pm of February 28, 2015. 5. Winners will be announced on March 4, 2015. Now you can have that chance to win exclusive prizes from Dermaline, so start sending in your entries. You may visit Dermaline Davao at 2nd floor TIRESMART Tionko Avenue Corner Araullo Street, Davao City. Or call them at (082) 3051873 / 0932 725 2879. I wish i could join the giveaway. I remember the brand dermaline when I was still in PInas. Really good brand. 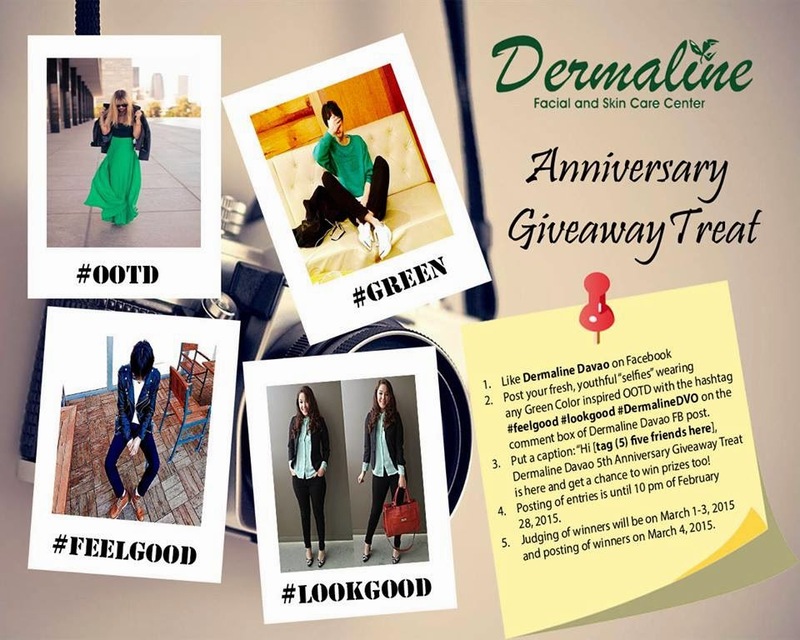 Happy anniversary to Dermaline and good luck to everybody who join the giveaway.